I made this dinner recipe for Joe when he was in town, and remembered what a lovely dish it is. If you are a fan of the "boneless skinless chicken breast," but tire of using it frequently, try this dish. It is just a simple, delicious meal that will impress. I got it from Rachael Ray, but added the Rosemary. You can really make it for any amount of people, just count 1 chicken breast per person (add a couple extra if you're feeding Joe). Slices of a good sharp white cheddar cheese. Dry off the chicken and season both sides with S&P, and sprinkle with Rosemary. Spoon the chutney out into a separate small bowl, so you don't contaminate your whole jar. Butterfly the breast starting at the thick side and open it like a book. Place about 2 small slices of cheddar and a small spoonful of chutney inside, then close. Heat 2 turns of EVOO in a large non-stick skillet. One the oil is hot, sear chicken breasts in the skillet 3-4 minutes each side, until golden brown. Use 2 utensils to gently flip. Don't worry if the insides leak out a little bit, it's yummy. Transfer the chicken to a baking sheet and finish cooking them through in the oven for 6 minutes or so longer. I like to serve with a side of mashed potatoes and steamed asparagus. Why not make this for your sweety for Valentine's Day? After I wrote about "The Last Box," I realized that not only did 2009 come and go, but our year anniversary of moving to San Antonio, TX in Dec 2008 came and went, and I did not even acknowledge it. It's funny now to think back on the days when Jason first mentioned the possibility of this move, that was Summer 2008, and I was in denial. And then when it became a very real possibility, I told him "I'm going to cry about this, a lot." I called my parents and was sobbing so hard they thought someone had died, so when I was finally able to communicate that we were probably moving to Texas, they were relieved. Back in the first months of 2009, I remember the frustration of unpacking, being alone all day in an empty house with mountains of boxes, that seemed to never to shrink. Plus, nowhere comfortable to sit because we moved with very little furniture. I also remember the frustration of trying to find my way around San Antonio, and the ridiculous outer road situation, and endless seas of parking lots. Sidebar: Along both sides of every highway in SA is an outer road, and if you miss where you wanted to go, you have to get off, take a "Turnabout" go back the other way, "Turnabout" again, and then try to find it again. If you miss twice, you will want to pull your hair out. All along the outer roads are endless mazes of stores connected by not well-thought-out parking lots. So that you can actually see the PetSmart that you want to go to, but can't actually drive your car there. But then came Spring, we were mostly unpacked (except for 1 box), we had some furniture, we met some wonderful San Antonio friends, and lots of friends and family came to visit us, and we had so much fun. I woke up a few days with hangovers I had not seen since college and I thought to myself "I can't keep up with these people." Then we started to travel- several times to St. Louis, starting with the sale of the House on Hartford, then California, then Portland... and then came end of July/August and the beginning of the dark period of 2009- 3 months of nausea. I still shutter to think of it. And I still hold fast to my conspiracy theory that the pregnant women who have gone before me lie about the horror of feeling nauseous for weeks on end, just so they can see other women go through it and laugh at them. But not me, I won't lie to you ladies. But, by mid October I was feeling better, started to be able to be happy about the baby who is on her way, and we continued to travel, and I got a big belly bump. So that brings us up to date. The best thing that I will remember from the year 2009, is the wonderful friendships we have made since our move to San Antonio. And that has really made the time we have spent here memorable and, well, fun. Last Monday I put my brother Joe (our last straggler) on a plane, and now it's back to just the 2 of us + 3 four-legged furry friends + 1 growing baby girl in my belly. I've started slowly taking down the Christmas decorations, and returned to work this week. We made our "Things to do before baby to-do list" and are going to whittle away at it for the next couple of months. Included on the to-do list is "Empty the last box." That's right, an unpacked box from our move from St. Louis. This box was sitting in the dining room until last November, when Jason put it into a closet because we hosted a friends' Thanksgiving at our house. It was like the elephant in the room, except I liked the elephant, because he was kind of funny. 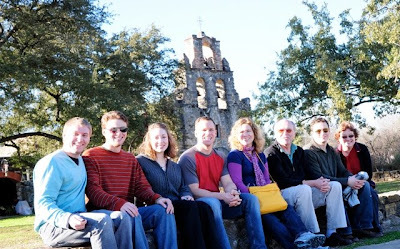 Here's a picture of my whole beautiful family, taken the day after Christmas at one of the San Antonio missions. Jason (married to me), Danny, Michelle (married to Joe), Joe, Me, Dad, Jon, and Mom.